Ray City Elementary School. 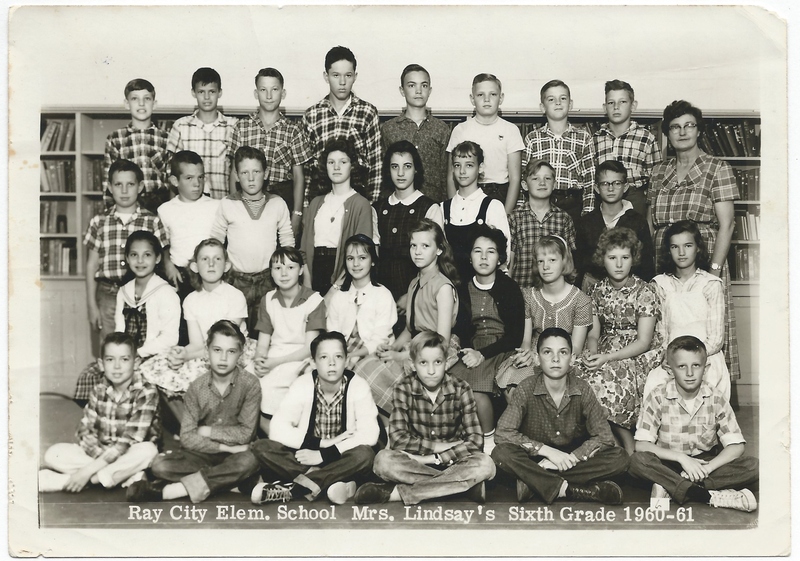 Mrs. Lindsay’s Sixth Grade 1960-61. Image courtesy of Edith Mayo. My name is Glenn Melvin Elkins I attended Ray city elementary school from 1963-67, played football with Rodney Martin, Steve Gaskins, Melvin Stone, Ronnie Elkins, we were the Ray City yellowjackets! Old Jimmy Salmans was our coach.My Girlfriend was Diane Giddens, my math teacher was Huey Barker! what a wonderful time that was!!! Mrs. Patten and Huey gave me some mean licks in 65! but Im a better person for it! Love ya Ray City!!!!!! Good times huh? By the time i was fortunate enough to graduate from there,the dump was falling down around our ears. Few years into high schooi i was asked to donate to save the place. Seriously? I said no,turned around and walked the other way. Good times huh? Well I guess everybody’s memory is a little different.